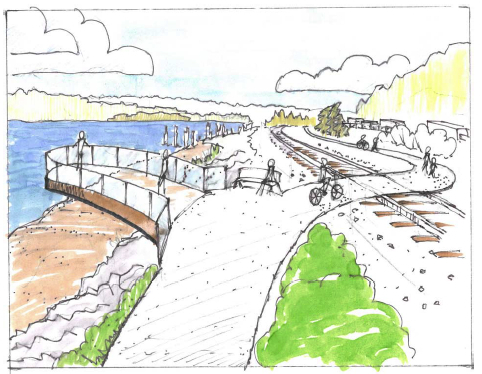 The final version of a concept plan to build a walking and bicycle trail along the shoreline from Gorst to Bremerton has been completed. The plan was distributed today. A viewpoint could be developed along the Sinclair Inlet trail. Almost all Kitsap County residents and most visitors are familiar with this route, because it is practically the only way to get to Bremerton and points north without taking a ferry or private vessel. More than 60 comments were received on the draft report. Suggestions were taken into consideration and included in the final version, but the basic concepts remain as proposed over a three-year period. Check out the report, called “Sinclair Inlet Development Concept Plan” (PDF 9.1 mb). Bryan Bowden of the National Park Service, who helped organize the effort and bring together various design elements, said the idea to separate the bike path from the walking path came out of a series of planning meetings involving many community members. While the separation would make for the trip more enjoyable for users, it may be more feasible to put the paths together on the highway side of the tracks, Bowden told me. Still, he chose to leave the plan as it came out of the committee. The next step will be to seek grants from the state and federal governments. Federal transportation grants include special set-asides for pedestrian and bicycle facilities. Other grant programs focus on trail development. Numerous state and federal grants could support the environmental-restoration aspects of the plan — especially for salmon streams such as Gorst Creek. See page 54 of the plan for a description of funding sources. If the project can be accomplished, it would open a major route for cyclists that few people now have the courage to travel. We should invest in our country with a new infrastructure stimulus package. We should rebuild our country this time rather than bailing out the Banksters. We could put some of those returning war heroes back to work on a project like this! I like it. I agree Robin and this trail would be great if it was part of a bigger infrastructure project here to widen this road or build a bridge. Seperating the bikes from walkers is unnecessary because no one will walk this. More bikes will use it though i am sure. we should invest in new infrastructure, such as this proposed Sinclair Inlet shoreline enhancement project and hire returning war heroes, whenever possible! I am glad that you are doing this. I have been promoting you and your idea about the shoreline trail. There is a key property that needs to be purchased and turned into a hub-park for this project. I have been encouraging members from Kitsap County and Puget Sound Partnership to help with this. I think it would be great to clean up Gorst and build this trail so that everyone can enjoy the area. Call me if you like. If you have any questions about the program, let me know. Thanks and great work on the plan. Attached is a copy of the final plan – ready to print! I am really pleased with the way this document turned out. Thanks to you, the KITSA Board, ENVVEST and everyone else who pitched in to help make this happen. I trust you will distribute a copy of the final plan to everyone involved with this project as well as to people who might be influential in helping make some of these ideas happen. If you find the money to print a substantial number of copies I would appreciate it if you could mail me about 5 to 10 copies. Please don’t hesitate to call or ask questions. I’ll be monitoring your success for many years to come. Hmm, why do we waste time and tax payers money with these ridiculous plans? How is the Bremerton Boardwalk project going? Really? Untold and un-REPORTED thousands have probably been spent on this, pleasing document. So some little gaggle of bureaucrats with a hard on to spent the public’s money can say “Look we’re doing something”, “Look at us we’re relevant”. How many Blackberry festivals will pass with artist renderings perched on little easels at the end of the pier will we have to endure? You people are going GaGa over this garbage are such suckers. I often take my kids camping on the Olympic Peninsula at one of several camp ground in the Olympic National Forest. These campgrounds were built nearly 70 years ago by the Civilian Conservation Corp created by FDR to put people back to work after Conservative policy drove our country into the Great Depression. It was one of the many smart things that FDR did to help turn the USA into the greatest nation on Earth. So you ask why do we spend tax dollars on projects like this? I’d say because I love my country and take pride in it. I want to invest in my country and it’s people. I know if my neighbors get jobs they’ll be able to buy stuff from me. That is how we can bring America back. I consider the NPS RTCA Sinclair Inlet Development Concept plan to be “priceless”, providing suggestions for aesthetically pleasing (creation and appreciation of beauty) Low Impact Development (LID) landscaping that can help improve water quality by reducing non-point source storm water pollution problems from nearby highways and benefit people, endangered marine life & wildlife. WIN-WIN! PSNS&IMF Bicycle Committee commuters are enthused with the “idea” of a ADA Bicycle Trail a safe distance from vehicles traveling at 50MPH+ through a “bottleneck corridor”, that can connect to other trail systems. Without an idea for a “Plan-of-Action” it would be near impossible for anyone to obtain watershed restoration grant funding for improvements. WSDOT currently (June 2012) has a bicycle grant available ( http://www.wsdot.wa.gov/bike/call.htm ). If we collectively do nothing because it will cost money, it is assured, nothing will happen and Sinclair Inlet will continue to degrade, to the point it may some day be lifeless. That would be sad, but it does not have to happen, there are numerous people doing what they can to improve or maintain our local urban bay water quality & try to keep excessive watershed litter in check. If someone does not apply for the WSDOT Bicycle Grant to help improve Sinclair Inlet, then the money will likely go elsewhere, our loss, their gain. Applying for grants, is not simple, it involves a lot of work (time/money) and research, but with the NPS RTCA plan a grant-writer now has a wonderful source of history and ideas to improve, without doing a lot of independent research on a short grant writing time deadline basis. Living with excessive trash on or near our local roadways, weeds (such as scotch-broom) and poor water quality, to the point it can not sustain life does not appeal to me, so I chose to do what I can to encourage improvements. The NPS RTCA plan for Sinclair Inlet conservation is perhaps the highlight for me of over 21 years to improve, starting with an Earth Day 1990 suggestion for Sinclair Inlet improvements to local, state & federal government officials, that lead to becoming part of a WA DOE Urban Bay Action Plan (1990-1993, until DOE funding ended, then volunteers took over watershed cleanups twice a year) for Dyes & Sinclair Inlet watersheds. Significant improvements have been made over the years since 1990 to improve local water quality, such as reducing the occurrence of storm water related Combined Sewer Overflow (CSO) situations in the City of Bremerton watershed, which did not come free or cheap, but needed to be corrected for a healthier environment and everything that depends on it. Without a “plan” for more bicycle trails in Kitsap County, our local communities could miss out on the important benefits of bicycling, like reduced road congestion, increased safety for people riding bicycles, lower health care costs from healthy exercise and ECO-TOURISM from people visiting our area (short ferry ride away from the BIG CITY of Seattle) for a pleasant bicycle ride in a potentially (with better landscaping & litter removal) beautiful area and making use of our local infrastructure, such as restaurants, motels, etc. “Project 7” is a proposed “Bremerton to Port Orchard” Trail that has not happened yet, almost 11 years later (June 2012). The 2012 NPS RTCA “plan-of-action” for Sinclair Inlet, ties in with work Kitsap County has already accomplished and proposes “in more detail” ways to improve our local watershed that should benefit everyone (people, marine life, birds, wildlife, etc) – is that worth it? – I believe so! Why improve Sinclair Inlet????? It will cost money! mountains, ships and water. It is also the “LEAST SAFE part of the corridor for pedestrians and bicyclists”. Cooperation between Kitsap County Public Works, the City of Bremerton, the Arizona and California Pacific Railroad, the U.S. Navy and the Washington State Department of Transportation(WSDOT) is needed to provide a SAFE and enjoyable trail experience between Bremerton and Port Orchard. NPS RTCA Community Planner Brian Bowden wisely recognized the complex ownership (US NAVY NAVFAC NW RR shoreline, WSDOT nearby highways, SR-3 and SR-304, WDFW controls the marine life & urban bay water column, WA DNR controls the sub-tidal zone land, WA DOE works on water quality issues such as TMDL) and has created a “concept plan” for our community, private citizen volunteers included, to “work together” to make improvements. Is that possible? Yes, I believe so and am encouraged by seeing other areas enhance their waterways for public enjoyment with best management practices conservation ideas. Public and private partnerships can be effective means for trail development & maintenance. It is really great to hear there is initiative and support for the Sinclair Inlet Trail. Currently there is no safe way to travel between Port Orchard and Bremerton, either on bicycle or walking, without crossing the highway. As a Bremerton resident I feel Bremerton needs much improvement for pedestrian and bicycle friendly trails. I think most people, too, realize that parking at PSNS is very limited. I often hear of people driving to work and parking outside the shipyard, and then getting on their bike and riding into work. I think many more people would consider riding to work from Port Orchard if safety was not such a major concern. The Kitsap Peninsula is beautiful and it would be great to showcase it as visitors and residents drive through that area; not to mention how nice it would be to ride your bike or walk through there. We are currently trying to build a trail from Northlake Way to Jarstad Park via Heins Lake and Alexander Lake. With the City’s help, we hope to name it the “Jarstad Trail”. We didn’t have the money to have all twenty wetlands checked, but the AMD will drain into Kitsap Lake, Heins Lake, Alexander Lake, Heins Creek and Gorst Creek on its’ way to Puget Sound. The Chico Creek Task Force is not a 501(c)3 and we need an environmental organization who is to help us protect the Sound. 100% of the Landscape Architects who participated in the design charrette in April 2009 did so on their own time and at their own expense (pro bono assistance). Thank you to all that helped! The concept plan was not produced by a ‘little gaggle of bureaucrats’. Rather it was sponsored and produced by the non-profit 501(c)(3) Kitsap Trees and Shoreline Association (KiTSA) with a moderate investment of planning assistance from the National Park Service, Rivers, Trails & Conservation Assistance (NPS RTCA)Program, Community Outreach Planner Mr. Bryan Bowden. 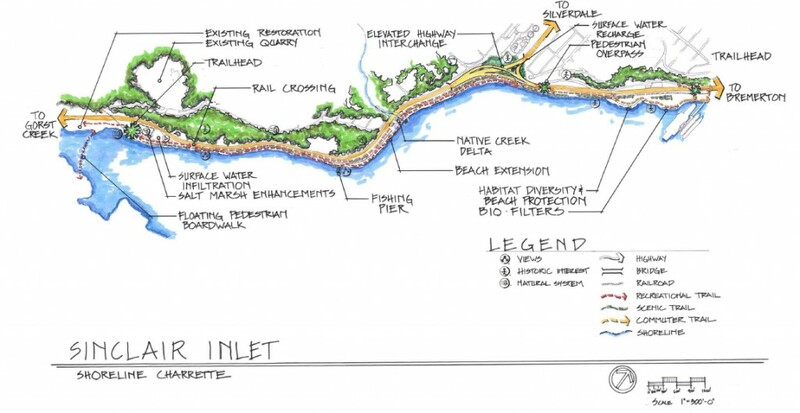 The Sinclair Inlet concept plan presents “a vision from local citizens and stakeholder groups and organizations who care about the health, environment, economic vitality, and overall livability of the region” that supports Kitsap County’s Mosquito Fleet Trail Plan’s proposed “Bremerton to Port Orchard” Trail (“Project 7”) of August 2001, with suggested sources of funding, such as urban bay watershed restoration grants to accomplish the goal of Low Impact Development (LID) Landscaping to help reduce non-point source pollution problems that has caused problems for local endangered Puget Sound Marine Life. In the opinion of the KiTSA Board of Directors this is a wonderful example of government at its best, working with local citizens in an effort to enhance & restore Sinclair Inlet with beautiful LID landscaping and a bicycle & pedestrian trail system, linked to other areas of the county (bottle neck area) to promote healthy exercise commuting, ECO-TOURISM ($$$$) and reflecting on the past history of Sinclair Inlet as a bountiful area for marine life for supporting native Indian Lifestyles and the Mosquito Fleet era of the 1890’s. WOW! – This maybe an ideal time to enhance Sinclair Inlet Watershed with Low Impact Development (LID) Landscaping & ADA Bicycle/Pedestrain Trail, possibly with tribal mitigation funding from the US NAVY. Please consider forwarding this message to interested Tribal, City of Bremerton, Kitsap County, WSDOT & US NAVY Officials for consideration. We have an opportunity to IMPROVE SINCLAIR INLET!!! !